If there is one thing I would love to do in my home, is to install a new kitchen. It’s also probably the most expensive home improvement too! With 2 boys currently at University and one more to go, there isn’t the budget for it at the moment. So in the meantime I went for kitchen update I could afford and that was painted worktops. 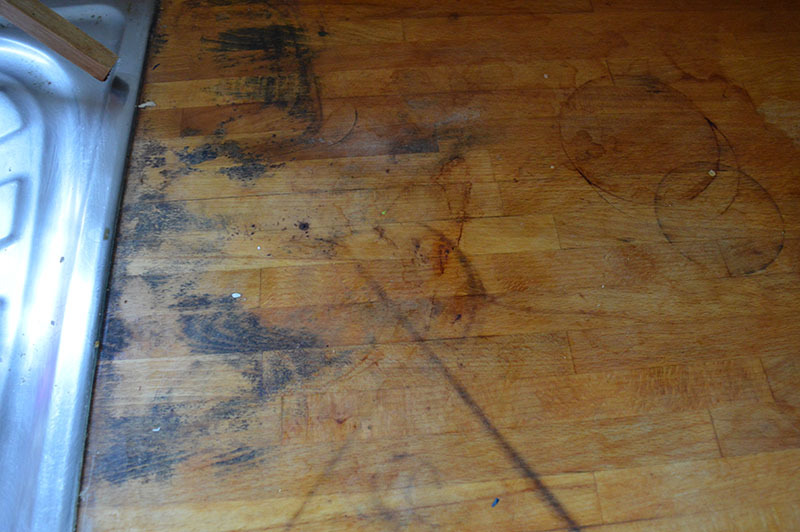 It’s not that I didn’t like my wooden kitchen countertops, but after 20years of heavy use, they weren’t looking good. Especially around the sink, the wood was full of black stains that no amount of sanding would remove. It was actually my sister Tasha, that suggested that I paint my kitchen worktops. She had done it a couple of years ago and was really pleased with the results. 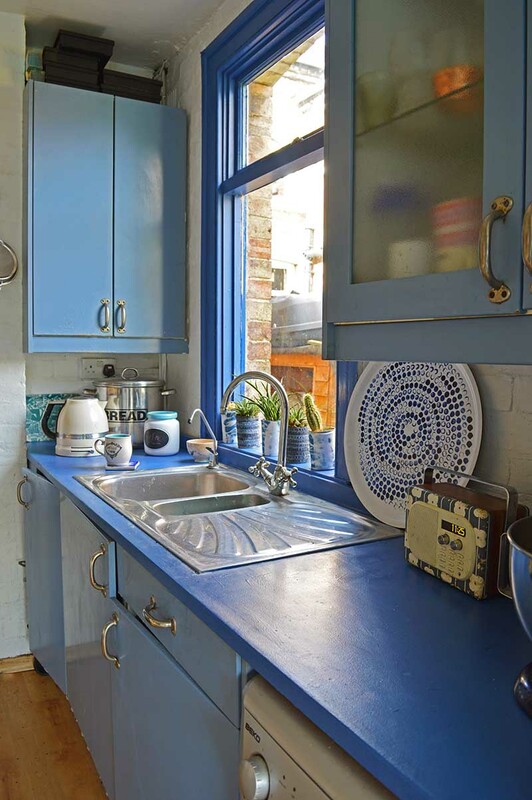 In fact, she painted her wooden kitchen floors and countertops with the same paint. 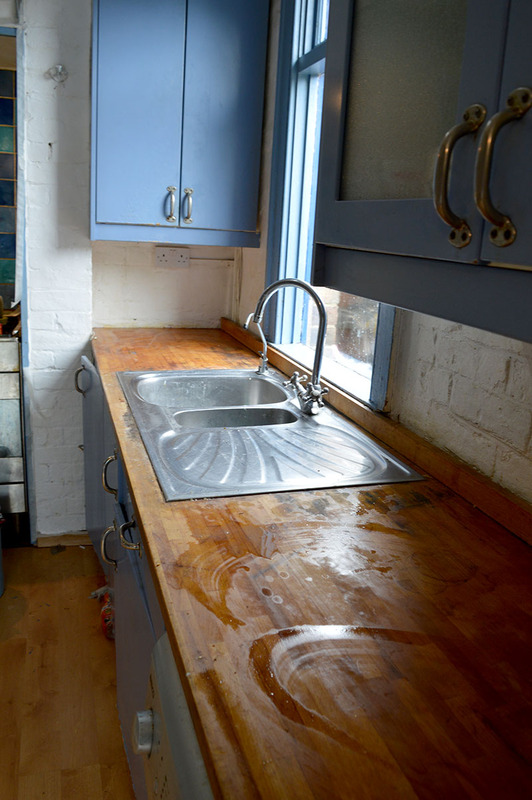 I’d never thought of using floor paint before for painted worktops. However, the floor paint idea sounded like a good one, as floor paint has to be hardwearing and you would want hard wearing paint for painted kitchen worktops. I’m really pleased with the newly painted worktops. The kitchen looks fresher and brighter, it will do me anyway for a couple more years before I can eventually afford a new one. Elliot my son did, however, comment that he thought it looked a bit Greek with the bright blue worktops against the white brickwork. Floor paint Since discovering Lakeland Eco Paints several years ago, I won’t use any other paints around the house if I can help it. The paints are VCO free so don’t give off any fumes. I know you can buy them in Europe but I’m not sure about the US. The paints are food safe too! My sister used a Farrow & Ball floor paint. I’m sure you could use any wood floor paint. The first thing is to sand all the old varnish and grim off the countertops to be painted with an orbital sander. 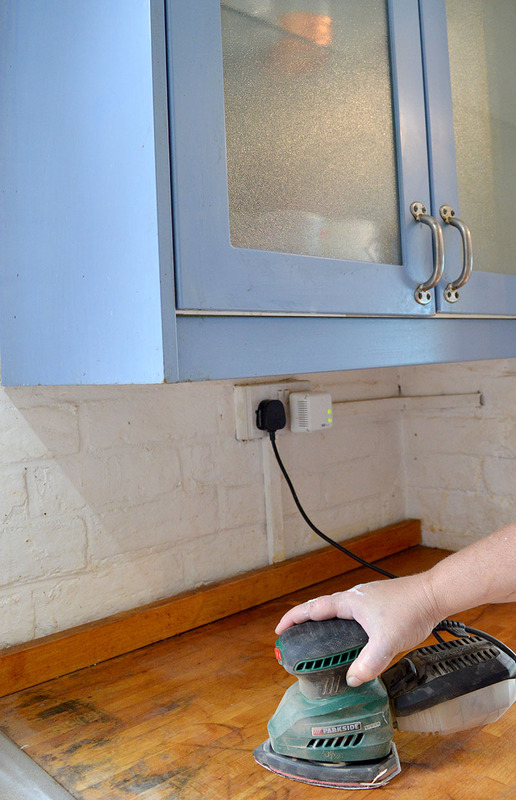 Once you have finished sanding the worktops, make sure you wipe them down and remove all the wood dust. Prepare the paint according to the instructions on the tin. If you use a small roller kit to apply your paint to the countertops, it will give you a smooth finish with no brush marks. I used 2 coats of floor paint, making sure the paint had dried thoroughly between coats. To finish off I added a coat of clear furniture wax as added protection especially around the sink area where the countertops often get wet. I’m really pleased with the finish on my painted worktops. The paint has gone on really smoothly and looks good. I will see how the painted worktops stand up over time. Tasha reassures me that the paint will last as it is durable floor paint. I do have some left in the pot just in case I need to touch up anytime. Whilst I had the paint there I painted my window and door frame to match the worktops and even my knife block and utensil holder. 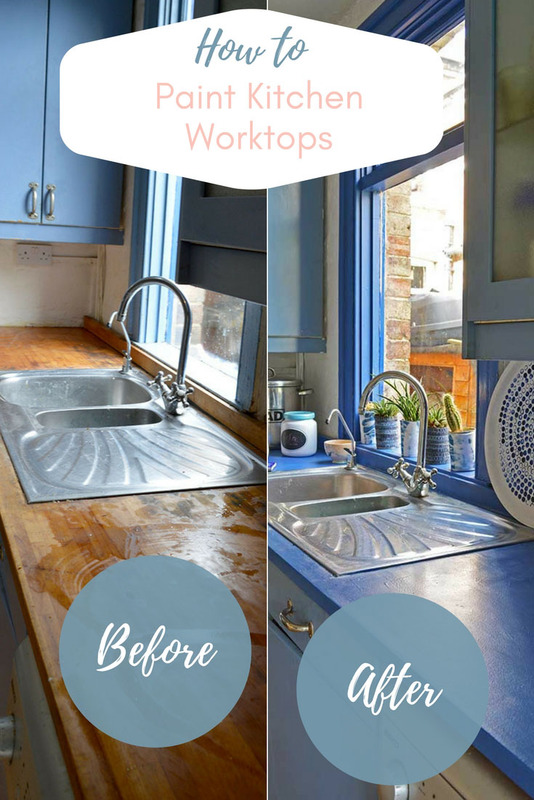 There are other ways to update the kitchen other than with paint, you can add a DIY splashback with wallpaper , or simply update your kitchen bin with wallpaper. Since painting the worktops, I also made some unique storage for the kitchen from an repusposed chair back. Can you use this product on laminate? I do not know as I haven’t tried laminate. I assume you would need to prime it first. Claire, your kitchen looks so happy and welcoming now. Your countertops look so much more attractive now. I wish that I could convince my daughter to paint hers as you did. The blues work so well together. I love blue as it makes me happy. The all white and gray kitchens so popular today do not inspire me. I think I could get very creative in your kitchen. 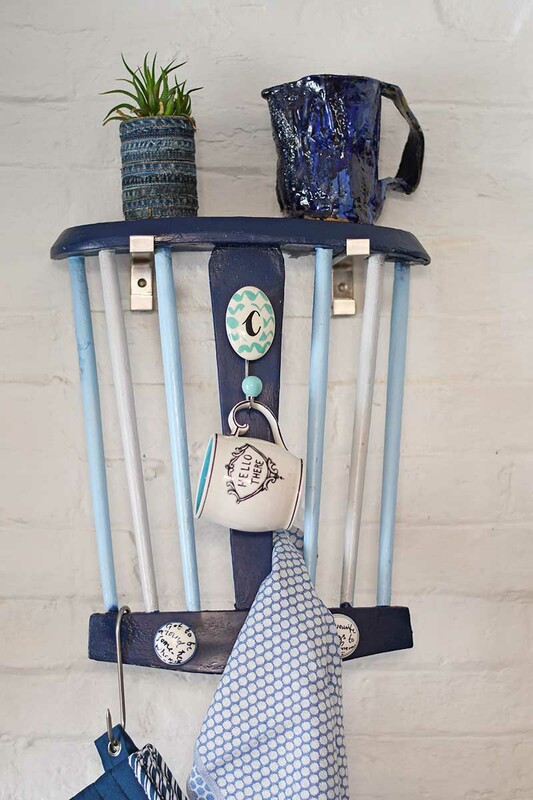 I wish that I could cross the pond and have a cup of tea in your cheerful kitchen! Aww, thank you so much Margret. 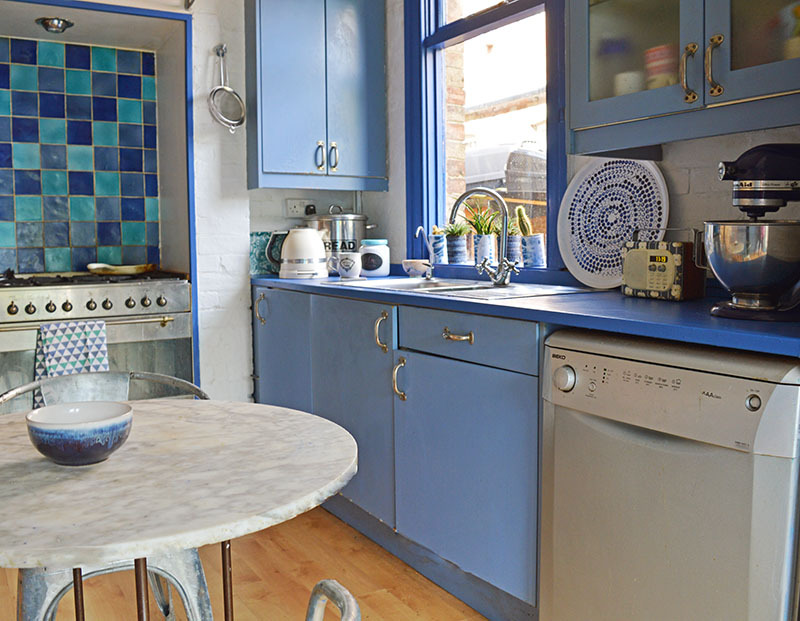 I have had a blue kitchen for twenty years now and I still love it. I do like colourful interiors, they always seem happy. Even though I’m English I’m more a coffee drinker than tea, so it would be a coffeee in my kitchen or a hot cup of cocoa even. I like the pots of plants on your window sill! What’s the plant in the middle with the long leaves?! Sorry I’m not an expert on plants it will be one I just picked up from somewhere like Ikea. Love your kitchen! It is so bright and happy. I know it would cheer me up every time I walked in. Thanks for sharing. Ahh, that’s lovely of you to say so, thank you. Your Great idea!Yes, Claire, it does look Meditearean.But I’m sure you can colour it any colour you want at the paint store. To make it make had wearing put a coat of clear gloss wood varnish over your tops. I’m sure the more coats of varnish you put over the top the tougher and more water resistant it will become use a bead sealant all around the tops and sink and then paint and varnish to prevent water getting under the wood and damaging it. For laminated surfaced apply a product that helps the paint adhere to the surface before painting. We have it in Australia so you should have it there. Thank you for your tips Elizabeth. I would have to make sure it was a food safe varnish though. The floor paint is food safe as I used an Eco-friendly floor paint. It is splash proof but I would either wax or varnish the painted tops in high water traffic areas like around the sink to protect it further. Thank you, it has certainly brightened it up. Wow, what a transformation. 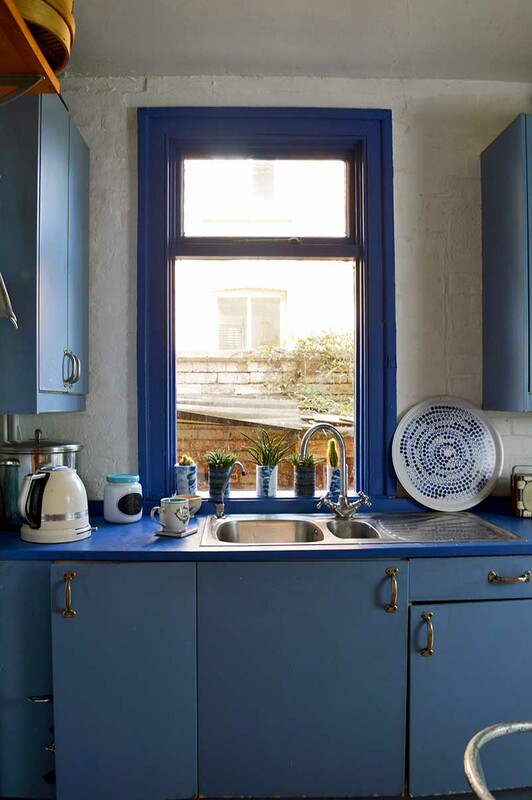 I love that blue, your kitchen really looks amazing now. I’ve been thinking of repainting all the doors and cabinets in my kitchen and looking at this I think they could look really nice. Thank you so much. 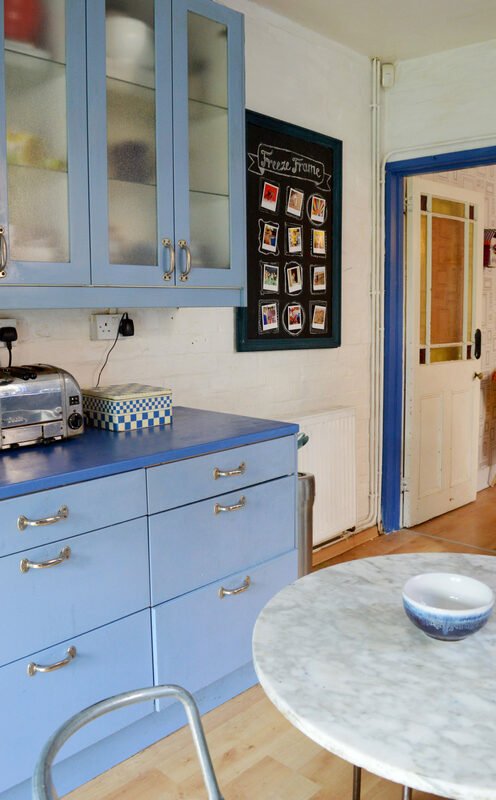 I definitely re-painting a kitchen is an affordable transformation. I am loving the color you picked, I literally just finished painting my hallway a similar color so I am all about the blue right now. Thanks for sharing this at the Dishing It & Digging It Link Party. Hope you have a great week Claire! Thank you so much Christine. I bet your hall looks amazing in blue. Thank you, it seems to be working well so far. Thank you, I’ve only painted wood counters I’m not sure about other counters but I think you can get specialist paints for Formica and other materials. Your countertops look wonderful! 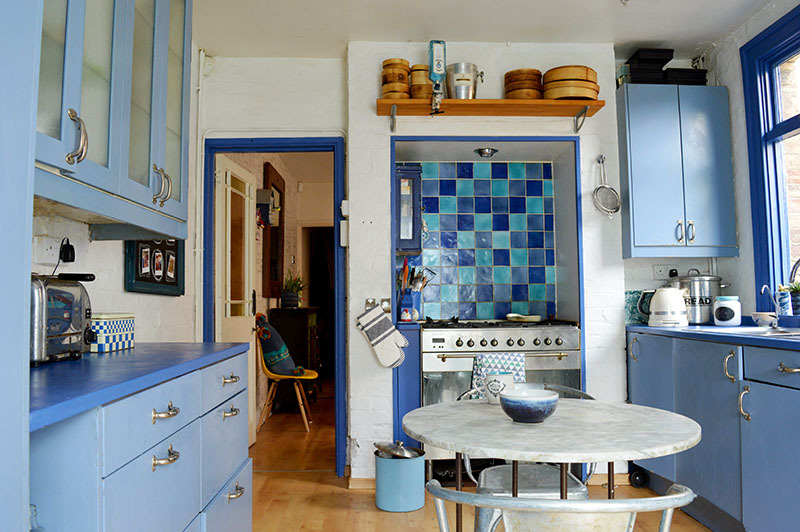 I love your bright cheery kitchen! 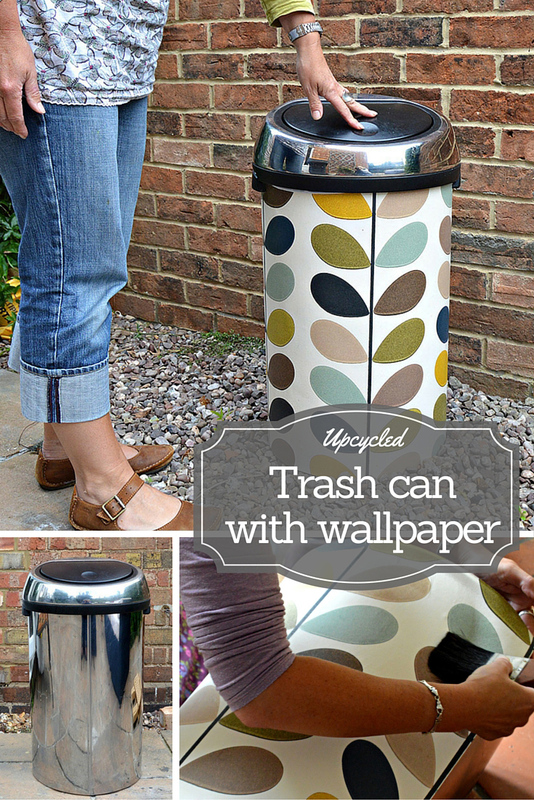 Thank you for sharing @Vintage Charm–pinned! Your son’s right Claie, it does have a Greek island feel to it now. But that’s kinda of perfect. Everything looks so bright and cheery. Thank you, Michelle. Yeah I can live with a Greek Island look, as you say it’s a bright cheery one. Claire you are so brave to paint your countertops! That was a great tutorial. I’ve been wanting to rip the carpet off my stairs and paint the plywood! This paint sounds like it’d do the job! Thanks for sharing! Thank you, Janice. I ripped the carpet off my stairs, stained the steps and wallpapered the rises. It was one of the best transformations I have done in the house. I do think you should go with it with your stairs. Painted stairs are so much fresher than carpeted ones. the power of paint is truly remarkable! great job mama! Thank you, I agree paint can really transform stuff. Your kitchen looks so cheerful! Thank you, Jen. I like cheerful! Wow! I had no idea you could paint them! Great to know! Thank you, nor did I until my sister painted hers. 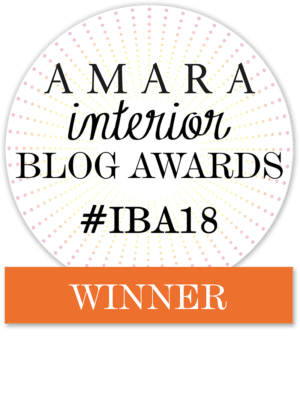 Your kitchen countertops look fabulous! What a great transformation!!! I love the look of butcher block counters but water is the one reason I could never do it. The update looks great and it really brightens your kitchen. Tell you son that all the ladies love the blue and white of Greece so you chose right 🙂 I know that will hold up well if it’s intended for foot traffic. My mom used a similar “special material” for counter tops on her formica. Sadly it hasn’t held up very well. Maybe we’ll try floor paint the next time. Thank you, Toni. I love the look of butcher block counters too but unless you are very careful they don’t wear well especially round the sink. I don’t know how floor paint would work on Formica though I imagine that is a difficult service to paint. Thank you! It’s holding up well so far. My sister did her worktops over 2years ago and she says her countertops are still looking good. I love that you’ve gone for such a bold colour! Totally rocking the double denim vibe. It’s brilliant! Thank you, Karen. I do like my blues! Claire I am also working on a kitchen so I can really sympathize. It looks really great and such an economical solution. Thank you, Mary. I’m really pleased with the results for now. Hopefully, we’ll get a new kitchen in a few years time. I’d love to see what you are doing for your kitchen.